Vacation rental condominium. Sleeps 6, 3 bedrooms, 4 bathrooms. No pets allowed. With a large corner terrace, you can enjoy panoramic Caribbean Sea views day or night from this 8th floor condo. Sunsets over the water are especially spectacular! Right from the moment you step inside the front entrance, you'll feel welcome, like you've arrived in your home-away-from-home. 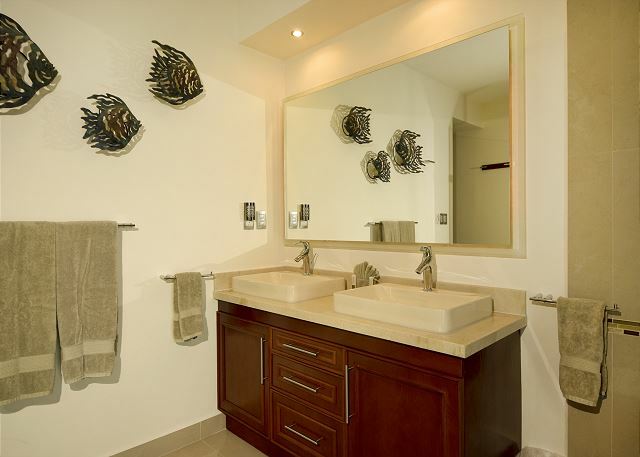 Great artwork and furnishings, a waterfall feature and modern amenities combine to make an amazing vacation rental experience. 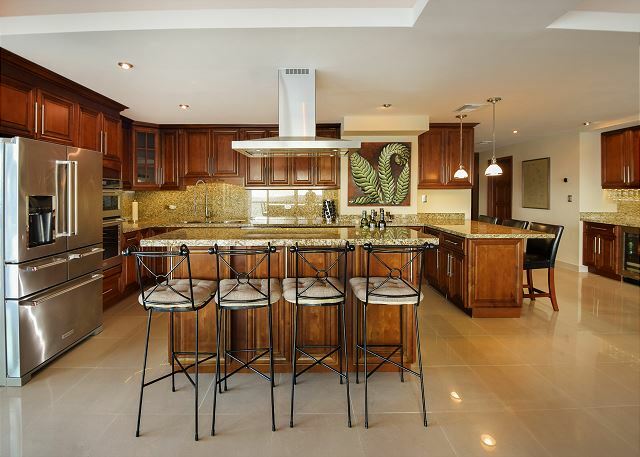 A phenomenal kitchen is totally equipped to prepare gourmet meals. There's a double oven, pull-down spray faucet, all stainless steel appliances and beautiful cabinetry. Perfect for extended stays, the condo has plenty of conveniences like a separate laundry room with plenty of storage and a stackable washer and dryer. There's also central air conditioning for your comfort. The dining room seats 6, plus there is a raised bar with seating for 4. An additional seating area by includes seating for 3 more guests. Revel in beautiful views of the aqua-blue Caribbean from every vantage point in the open-concept layout! In the living room you can put your feet up in the recliner or lounge on the sectional couch while you take in breathtaking ocean views. The stunning master bedroom suite includes a jetted bathtub and shower with an adjustable head and a multiple shower head panel below. 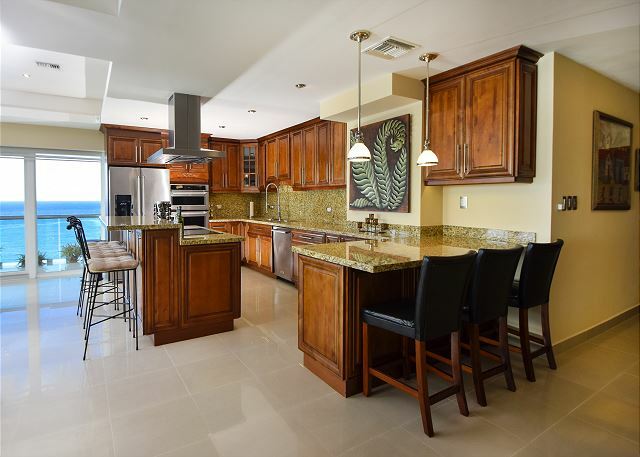 All three bedrooms have dazzling ocean views, flat screen TVs and terrace. 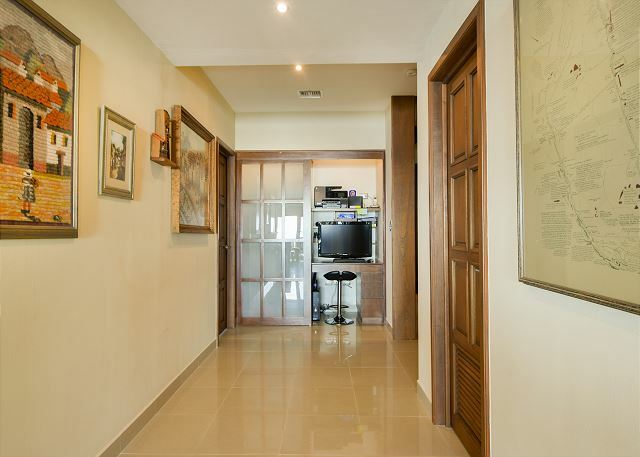 Downstairs you and your family can enjoy the Olympic-sized swimming pool, clubhouse, basketball and tennis courts. Palmar also has its own water filtration system on-site. The condo is located about 10 minutes away from downtown on the island of Cozumel, and snorkeling is just across the street!